Excludes links where (#votes/#views) <20%. Includes all links no matter how few votes. From ~30 expert interviews and online submissions we broke down this large problem into ~90 mini-challenges for democratizing data. Each ‘node’ to the right is one of those challenges. THIS IS THE FIRST CROWD-MAPPED NETWORK STRUCTURE OF A COMPLEX PROBLEM! We called on a community of experts to identify strong relationships among all possible pairs of challenges. Using an online tool, the MAPPR, they evaluated, for each challenge, if it improves, does it improve others? or make them worse? For this first phase, about 40 people participated resulting in >6,550 link votes, to create a “Full” web of 3,842 links, or a “Consensus” web of 1,786 links. We analyzed both webs to identify results that are robust to this uncertainty in the crowd-defined network. In each, ~93% of the links were ‘positive’ relationships - meaning that solving one problem helps solve another (rather than making it worse). have broad direct reach to almost the entire network. They are like ‘JFK’ or ‘Chicago O’Hare’ airports with ‘direct flights’ to or from the vast majority of other challenges. …and these marketplaces directly benefit from improvement in many other areas. These hubs may be ‘auto-catalytic’ challenges that are naturally improved by current market forces. AVERAGE PATH LENGTH is the average shortest path, or number of ‘hops’, from that node to every other node in the network. 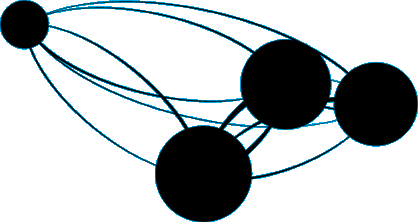 CONNECTIVITY is the total number of incoming and outgoing links. are challenges that, if solved, have a strong direct influence on many problems, but are weakly influenced by few. The yellow and orange nodes are among the top ~25%. The yellow nodes were identical independent of whether we included every single link vote (the ‘Full’ network), or whether we removed over 50% of the links for the ‘Consensus’ network. The orange nodes were less robust to this uncertainty in network structure. the ability to anonymize personal data has a positive direct influence on many other challenges. Consider a citizen journalist witnessing government violence in the street; if they have easy access to tools to anonymize their personal identity, they are more likely to document and share that event, and it’s more likely to catalyze an entire community of citizen reporters while protecting them from the threat of surveillance, imprisonment, or death. …but this challenge only weakly benefits from improvement in a few other challenges. One reason why these types of privacy tools may be 'under-nourished' is that there are not clear short term market incentives for helping people anonymize their personal data... Even though addressing this challenge could, in the long run, catalyze new economies around data sharing. These are challenges that if solved could help solve many, but have comparatively few things weakly helping them. We only included the yellow nodes that were the same in both the ‘full’ and ‘consensus’ networks. In other words, these results were robust to removing over half the links that had few votes per views. For example, the ability to anonymize our personal data has a positive direct influence on many other challenges – like the number of people who will voluntarily share personal data, and the ability to catalyze a critical mass of community engagement. For example, if many people having asthma attacks voluntarily share those events with the public, the broad patterns could help identify geographic outbreaks related to air quality conditions. More people would participate if they knew their personal identify was stripped from the event so they would not be at risk of being denied health care coverage. We used a force-directed layout to cluster those challenges with high asymmetric centrality into a few groups that are closely connected and conceptually similar. Note that these clusters are similar regardless of whether we consider the ‘Full’ or ‘Consensus’ networks. The only difference is in the 2 orange challenges we subjectively classified under ‘Platform Openness’ because they were conceptually distinct from the rest. From the original ~90 challenges identified by experts, 4 potential grand challenge areas emerge. These were defined by a community, and they can evolve with more input. How can #WeTheData benefit from (and avoid being harmed by) the explosion of data we generate everyday? We used an ecological network approach, developed by Vibrant Data Labs, to make sense of this messy problem and identify Grand Challenges for catalyzing positive change. ~90 challenges and >3,500>1700 links identified by the community!